Every Wednesday, over at the Idaho Etsy Team blog we’re hosting a Work-in-Progress Wednesday. It’s a chance to link up ANYTHING (craft related or not) that you’re currently working on. So head on over and join the party! Can’t wait to see what everyone else is up to. This is so incredibly far away from being sewing related, but it was really too fun not to share! Dakota is our “first” baby; it’s hard to believe he’s been with us for almost nine years now! Life has certainly changed since we first brought him home and some days I’m not sure he appreciates the extra chaos. The youngest one in the house has recently taken to flopping herself on top of him in an adorable attempt to wrestle. In response, he spends much more time up out of her reach in the recliner in the living room. He’s in trouble when she gets big enough to climb into the chair with him. Saturday I woke up with a migraine that completely side-lined me. Knock me on my back, not get out of bed type of headache. Years ago I suffered from these headaches all the time; now I’ve completely lost my tolerance for the pain (although I’m certainly not complaining!). So to get hit by one so painful and so debilitating completely wrecked my weekend plans. Thankfully my wonderful husband took over all parenting duties for the day and even accompanied the girls to the birthday party they’d been invited to. Yesterday in an attempt to catch up I sewed my way through six yards of fabric, creating 5 peasant tops, 2 dresses and 2 pairs of ruffled capri pants. I even managed to get my sewing space cleaned, made dinner and spent some time with the family enjoying the beautiful weather. Today, I’m tired. But with new fabric delivered on my doorstep this afternoon and a super cute romper pattern waiting to be tried out, there’s no rest for the weary! UPS dropped off Riley Blake deliciousness while I was out running errands with the girls last Friday. Due to a jam packed weekend schedule — it was our wedding anniversary after all — I opened the packages but set the bolts of fabric downstairs in my studio, not even picking up my rotary cutter until yesterday afternoon. Don’t worry, I had visions and ideas bouncing through my head most of the weekend! So when I sat down yesterday I knew exactly what I wanted to do. This is what came together after a couple hours of work. Not fair, I know! I will tell you that it’s a super cute peasant dress with half sleeves and a ruffle panel down the front of the dress. Hopefully it will be ready to list in the shop within the next couple of weeks. This has been one of those weeks that I’d like to either forget quickly, or have the option to re-do, in the hopes of it going better! It all started last weekend with TWO emergency service calls on Saturday (a water leak and a circuit board that quit on the furnace), a Saturday visit to the pediatrician for both sick girls, a dog that ate the corner off of the afghan my grandmother crocheted for me 20 years ago, my husband out of town for work, a finicky gas gauge in my vehicle, organizing tax stuff, troubles with the postal service, me getting sick and a babysitter that bailed, leaving me to scramble for a replacement! Which meant little time for Stitch To Stitch stuff, especially the blog! Thankfully I could sneak in some sewing here and there as my sick girls napped and with my husband being gone at night I had free time after the house settled down for the night. To end the week on a good note though, I have my first wholesale order from Riley Blake coming today with FOUR BOLTS of fabric! (I seriously could have ordered three times that many, but my bank account wouldn’t allow for it right now.) And I managed to crank out a new dress for the shop earlier this week. It’s on it’s way to a fabulous new photographer I’m excited to work with. I seem to be drawn to spring/summer stuff right now! I don’t know if this weirdly warm weather has tricked my brain into thinking it’s further ahead in the year than it is, or if I’m just ready for nicer weather to be here. Nothing against winter — as strange as it sounds, I absolutely love the season — but it’s harder to deal with nasty weather when you have small children. Today’s tutorial is the super cute Pillowcase Nightgown featured over at iCandy Handmade. Last summer, my five year old started to finally want to wear nightgowns. Truthfully, I think it’s because they feel more princess-like than standard pj pants and a top. 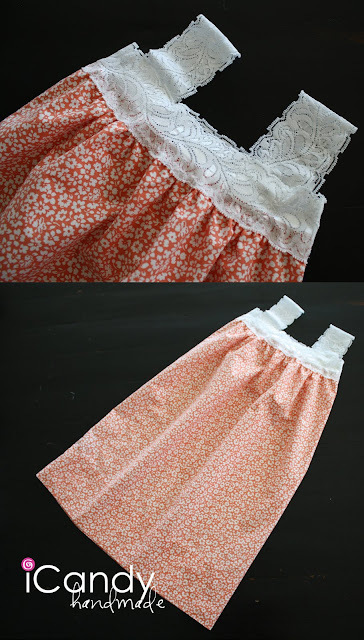 No matter the case it will be fun to make her some of these nightgowns for use this summer!